I’ve been spending a ridiculous amount of time lately looking at winter boots; I’m drawn to big platform heels, chunky soles and leopard print but in reality have to pick something a little bit more foot-friendly to do the school-run in. Sigh. I actually gave in to the ones on the top right, which are from ASOS; my main requirements were that they were a) waterproof, b) quick to put on and c) easy to walk (or run!) in, and these were literally the only ones I liked that ticked all the boxes. I’m also hoping that the big sole will keep them warm if we get the big freeze they’re predicting (although how they can guess weather months in advance is beyond me! ), and I love how despite not having a platform heel, they still look suitably bulky. I’m not a big fan of delicate boots; I just prefer the way chunky ones look with jeans and tights. 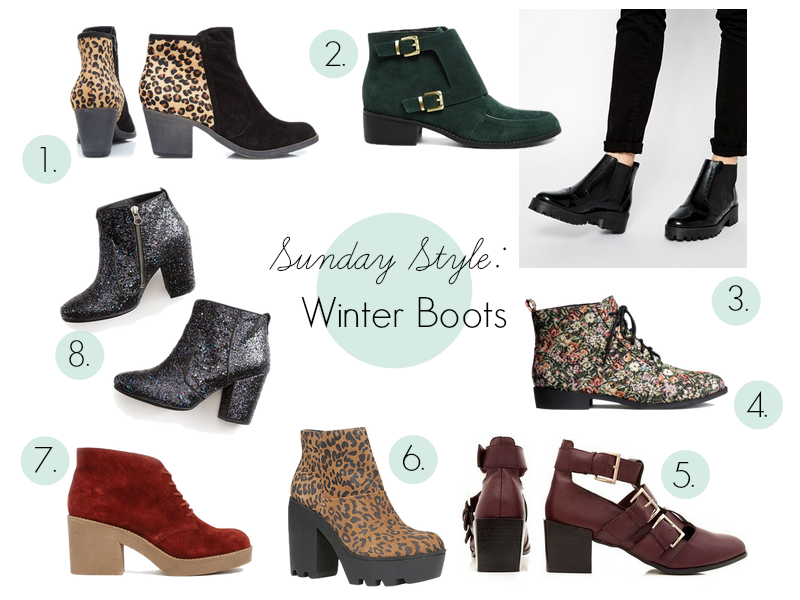 Have you got your winter boots yet? If you’ve seen any good ones, leave a link in the comments! Oh I saw those Boden glitter boots in the flesh at the press day and they are awesome, especially in blue – very glam rock!